What do we want to be when we grow up..........? This term we will be starting off with our annual careers week. The children in Foundation Stage will have the opportunity to experience a wide range of careers and learn more about them including: teachers, nurse/doctor/dentist, mechanics, chefs, builders, archaeologists, librarians. We will watch this lovely video of our introduction to careers week. 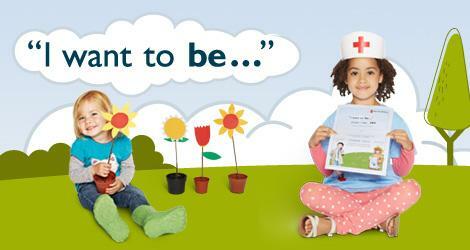 The children will be able to talk and share their ideas and thoughts on what they would like to do when they grow up. On the Monday all children are invited to dress up as what they would like to be in the future. We will have a P4C discussion session based around a series of pictures of people in their work environment to get the children thinking of questions that they would like to know the answers to. The children are making an information book based on their careers choice. We will taking trips into the community look at different types of careers. Following on from this we will be looking at Harvest with a visit to Tesco's looking at produce, weighing and buying food items. The story of The Tow hungry Bears in Literacy will form the basis for this theme along with The Enormous Turnip. We will use the story map to help us retell the story. This will lead us into preparing for Christmas and our Christmas performance.